Shopping online you can find them through a number of sources, one we have used and recommend is made by 6 Pack Fitness. It is durable, strong, roomy and keeps food cold for extended periods of time thanks to the insertable, reusable ice packs. They come in a range of styles and sizes to fit your needs from travel for a weekend, to backpacking, even cases perfect for a professional day at the office. 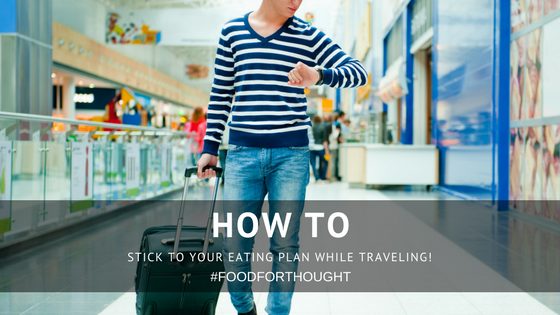 Many bag sizes fit in the carry on compartment in the majority of airliners so even if you are flying, that should not deter you from your nutritional goals. 1. Grab some hard boiled eggs. These make an incredible protein packed snack. If whole eggs do not fit into your daily macros, snack on the egg whites and toss the yolk. Each egg white contains 3.6grams of protein and virtually no fat. 2. Fat-Free Greek Yogurt (8oz) – add in 1 cup of berries and a tablespoon of almonds for flavor and texture. 3. Quest Protein Bars – These come in a huge assortment of flavors. They are nutritionally balanced and can keep your energy as a great occasional meal substitute. 4. Go Nuts! – Cashews, Almonds, Macadamia Nuts, Pecans, Walnuts – all are healthy fats and high in protein. 5. Protein Shake – Pre portion shaker cups at home, toss them in your bag. Just add water and shake! This is a great way to make sure you meet your protein requirements daily with no hassle. Keep in mind that shakes are a supplement. Your main source of protein needs to come from whole foods. 6. Beef or Turkey Jerky – Tasty, healthy, filling and easy to carry. These are a must have for car trips, plane flights, and even backpacking. 7. Liquid Egg Whites – Gross!? You may be thinking – But many bodybuilders actually drink egg whites. It is an instant, easily digestible form of protein that you can grab on the go from any grocery store. When cold and right out of the fridge, drinking them actually tastes pretty good! 8. Rice Cakes with or without peanut butter – Rice cakes can satisfy that need to crunch without extra calories, fats or preservatives.